i tried to activate the 2FA for my Account. 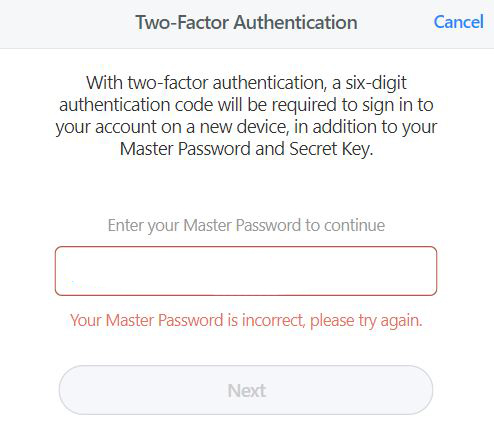 Your Master Password is incorrect, please try again. But it is right. I'm able to Login in 1P X and the Website. @blaxxz: Thanks for reaching out. I’m sorry for the trouble! It sounds like you're trying to setup two-factor authentication in your 1Password.com account on the website, not use 1Password X, so I've moved you to the Memberships category of the forum. Just be sure not to post anything sensitive, as this is a public forum. Also, what are you using to generate the TOTP code — device and app? Thanks in advance! @blaxxz: You'll need to enter the Master Password you set up for your account. Are you typing your Master Password, or using 1Password to fill it? Which OS and browser versions are you using? Are you using more than one account in 1Password X? Im using only one Account in 1P X.
Im typing the Password and not 1P X. And the Password is correct. Ist the 2FA for all subscriptions available? I tried it again and do the same things like before. So it is fixed now, thanks. Thanks for the update @blaxxz. Glad to hear it is working.